Once learners have completed Foundational Level 6, teachers may use HTM to complement their work with prayers and blessings. The JECC makes it easy, with teaching ideas and resources available for free download from the HTM website. You'll find lots of assistance for working with Sh'ma and Its Blessings, as well as the Amidah. Shorter blessings are taught in a number of the Holiday Units. I know that many directors have seen the HTM exemplar video - the one that demonstrates teaching of the Four Questions. But, only some of you know that when we completed taping this lesson and turned off our camera, the students had strange looks on their faces. When asked why, they said that they never knew what the words meant. Yet, via this 15 minute lesson, the kinesthetic use of Hebrew Through Movement put the meaning of the target words into their kishkes. That, in itself is a great story, but the best part came a year later when a Cleveland Hebrew teacher spent three sessions teaching the Four Questions with all the techniques one could imagine - explanations, flashcards, technology, games, etc. But at the fourth session, she decided to teach the HTM lesson she had seen in our video. The teacher reported that when she completed the lesson, her students had strange looks on their faces. When she asked why, the children said they had no idea what the words meant before the Hebrew Through Movement lesson, even though they had three other learning sessions. Thus, this is the power of HTM for teaching prayers, blessings and rituals. Students learn vocabulary in a very natural and engaging way, with the language sticking deep in their kishkes. Our Facebook group, "Hebrew Moves Me!" The most recent version of the curriculum guide, available for free download from HebrewThroughMovement.org. As director, you'll find it very helpful to read the overview pages at the beginning. Keep enjoying all that Hebrew Through Movement offers you, your teachers and learners! Let's get campers jumping and running to learn Hebrew! Hebrew Through Movement has been energizing Hebrew learning across North American for the last 5 years. With its start in Cleveland, OH over a dozen years ago, HTM brings laughter and smiles to the learning of Hebrew. And, because of its kinesthetic nature, Hebrew is sticking deep in the kishkes of its learners. Why play the number game? Because it’s informing to consider how many children attending our Jewish summer camps might have a Hebrew background that is different from past generations of campers. It’s an opportune time to consider introduce Hebrew Through Movement at Jewish summer camps, creating a stronger synergy between Hebrew learning in congregational and camp settings! Hebrew Through Movement is based on the principles of “Total Physical Response” (TPR), developed by Dr. James J. Asher decades ago. TPR is an acquisitional language learning model, meaning that it follows the learning process of babies in their native language – they first hear language and then move their bodies in response (think of a baby who lifts her hands in the air when an adult says “up” right before lifting the child up). With multiple exposure, the young child develops a more sophisticated understanding of vocabulary – “chair” refers to that big soft brown item in the living room, the harder chairs in the dining room, and the highchair in which s/he is fed. Following the natural flow of a young child’s language learning, there are no expectations for learners to produce language in a Hebrew Through Movement lesson. Rather, the teacher offers commands and the campers react to the language. When learners hear לָקוּם lakum they stand up, and when they hear לָשֶׁבֶת lashevet they sit down. To lower the stress that often accompanies language learning, HTM learners are encouraged to watch and then mimic others, if needed. This creates a very social experience, bringing all into the fun and learning process. There is no doubt that HTM in Jewish summer camp looks different from a congregational or day school setting. Whereas the ultimate goal of Hebrew Through Movement in most congregations is to open up the Hebrew of rituals, prayers and blessings, summer camp allows for an expanded set of vocabulary like Hebrew names of camp buildings and locations, clothing, utensils used when eating, food, and names of sports. Hebrew Through Movement takes minimal time - lessons are only 10-15 minutes each, taught with a specific lesson structure that creates success. In part-time Jewish educational settings, HTM is scheduled each time that children are in session, once or twice a week. Camp offers the advantage of daily (or almost daily) Hebrew learning. A two week session, with 10 HTM lessons, would produce as much if not more learning than a part-time program once a week over a semester. Frequent, short learning opportunities, with little or no absences, creates a powerful language learning model. While Jewish summer camps are ideal Hebrew Through Movement laboratories, they also offer unique implementation challenges. However, these are easily mitigated. HEBREW BACKGROUND OF HTM LESSON LEADERS: Ideally, a Hebrew Through Movement teacher has intermediate to advanced Hebrew language fluency. However, HTM has been successfully taught by teachers who have taken a semester of Hebrew in college or a couple of adult education language courses. So with some camp staff taking Hebrew in college and the number of Israelis on staff, camps can find multiple people with the requisite background to lead HTM sessions. A bonus is that as other staff participate in Hebrew Through Movement lessons, they learn enough Hebrew to reinforce the learning throughout the day – in the hadar ohel, on the way to sport activities, etc. GROUP SIZE: The best HTM learning happens with up to 15 learners because group dynamics are more manageable at this size. Hebrew Through Movement would be challenging with an entire unit of 40-60 campers, but there are ways to divide the group into manageable sections with multiple staff trained to lead lessons and creative thinking about when and where campers might enjoy HTM during the day. Before or after an all-group program it may be easy enough to integrate a 10 minute HTM lesson. While waiting for campers in the pool to clear out for the next scheduled group, a staff member can jump (ha!) into action. Specialists could integrate Hebrew learning in their disciplines (e.g., teva, art), taking 10 minutes a few sessions a week to introduce vocabulary the group might use during a session. A cabin counselor could take time for an HTM lesson after campers have finished chores like cabin clean up or hadar ohel set up. STAFF TRAINING - It might be tempting to assume that formal training isn’t needed for teachers of Hebrew Through Movement, but it is. Hebrew Through Movement lessons have three distinct parts that create success for learners (teachers, too), as well as guiding principles that undergird the learning model. The Jewish Education Center of Cleveland has developed an online, 10 module seminar that is available 24/7. For camp staff who might wish to teach HTM during the school year at a local congregation or part-time Jewish educational program, this is a great option. Because the JECC assigns each camper a learning facilitator who offers feedback on each of the module assignments, there is a $100 tuition charge. The JECC is open to developing a more compact online training seminar for summer staff, but needs the commitment of a few camps to enable this to happen. Luckily, a number of summer faculty (Jewish education directors who serve for part of the summer at camp) have taken the JECC’s online seminar - they could teach HTM, help coordinate between HTM staff, and coach those new to this model of Hebrew learning. Learning begins with Foundational Units that teach that basic vocabulary that get learners moving, literally. In lessons taught completely in Hebrew campers are introduced to commands: Get up, sit down, stop, run, jump, spin, point to, lift up, etc. So as to fit the short bursts of learning time (10-15 minutes) the Hebrew infinitive is used לָקוּם (lakum; stand up) rather than the command forms directed to one male קוּם (kum), one female קוּמִי (kumi), or a group קוּמוּ (kumu). There simply isn’t enough time to help novice language learners gain all the grammatical nuances. Stand up and jump to the flower. Run to the dining hall. Lessons begin with a review of past vocabulary. Then, the teacher models the meaning of 3 new words, bringing campers into the movements and thus, the learning. Each lesson ends with an integration of the new learning with previous knowledge. Campers progress through at least five of the Foundational Units before branching off into thematic vocabulary. The Hebrew Through Movement curriculum guide includes Holiday Units, though other than Shabbat which teaches key vocabulary for ritual objects and blessings, these aren’t appropriate for camp. However, the original written curriculum guide also contains Prayer and Blessing Units which could be used at camp to open up the meaning of t’fillot prayed on a regular basis. The Jewish Education Center of Cleveland has posted a camp-focused version of Hebrew Through Movement on the homepage of this website; it will be available for free download. Please let us know how HTM works at your camp! Come join the conversation on our Facebook group: https://www.facebook.com/groups/194398270732234/ (or search for Hebrew Moves Me!). Kindergarten through Grade 1 - Foundational Units are taught, with some focus on holidays once students have completed Level 5. Grades 2 & 3 - Foundational Units are heavily reviewed and Holiday Units are introduced. The Synagogue Unit is also a great addition for third grade. Grades 4, 5 & 6 - Ditto on the above PLUS Hebrew Through Movement commands are introduced to open the meaning of blessings, prayers and rituals. Check the HTM curriculum guide (downloadable from the homepage of this website) for more thoughts on using Hebrew Through Movement to help with "print literacy." The goal of Hebrew Through Movement is to open up for our students the blessings and prayers that are core to our rituals. A Cleveland-based Community of Practice has spent this year exploring what this could look like - you'll see the fruit of some of their labor on the Pesah Holiday Unit page including a really wonderful video that shows that it could mean to teach the Four Questions using HTM. But you'll also find on that page easy-to-download teaching scripts, pictures that illustrate vocabulary and concepts, and teaching notes, all from this quite productive group (way to go, Cleveland!). In addition, a Sh'ma and its Blessings curriculum that will be released by the JECC this summer, will include an integration of Hebrew Through Movement in the more common blessings/prayers taught in that section of our t'fillah. So, how are YOU thinking about the curriculum spiral for next year and what questions do you have? Feel free to post in the comment section (below), come join us in the "Hebrew Moves Me!" Facebook Group, ... or both! Changing the Way We Teach Hebrew in Part-time Settings! After three to five years of “Hebrew School,” our pre Bar/Bat Mitzvah age students studying in part-time Jewish educational settings often complain that they don’t know Hebrew. And certainly when compared to their successes in Spanish, French or Chinese in their elementary school public or private school classes, they have a right to feel like something is amiss. To help open the conversation, I’m delighted to share a short video that I’m hoping will provoke discussions amongst a variety of Jewish professionals and lay leaders: educators, clergy, professional staff, faculty, education committee members. The video suggests three reasons why pre-Bar/Bat Mitzvah age students are not succeeding in learning Hebrew to the degree we might expect, and offers three strategies that will create stronger success. Some of the arguments will feel familiar – e.g., not enough time to achieve our goals that haven’t changed for decades, even as the number of days have decreased for Jewish learning. Some may feel counterintuitive – e.g., that learning to decode Hebrew is not as easy as those of us who already competent in this skill might feel. And some are not for the faint-of-heart – e.g., that we shift the learning of decoding to the later grades. I firmly believe that the Hebrew model that has been in use for decades is not serving our students well and that the learning process needs to honor sound-to-print language learning, even in our part-time settings. I’m not asking you to agree with me, but I would like to open the conversation. As mamy of you know, the JECC has been working on curricular materials that support a sound-to-print model of learning Hebrew, including Hebrew Through Movement and Let’s Learn Hebrew Side-by-Side. It would be wonderful if over the next few years, alternative curriculum and materials would be developed by other educators - ours is but one approach, and there will hopefullly be many! In the meantime, feel free to use this video as you wish. And please feel free to click the COMMENT button and share your thoughts, questions and concerns. “No, it’s impossible.” That was my position, and that of many other educators, when asked about the efficacy of teaching Hebrew language in part-time Jewish educational settings of two sessions or less a week. But our tune has changed, thanks to the groundbreaking work of Dr. Lifsa Schachter and the pioneers who joined her in introducing Hebrew Through Movement (HTM) to children who attend “Hebrew School.” While some educational programs have been using this Hebrew language model for 4-6 years, most across the country are still in the early stages of implementing the curriculum for their students. Utilizing the Hebrew Through Movement curriculum guide, beginning with the Foundational Units that are filled with commands that create movement, embellished with a variety of nouns and adjectives. Continuing on in the curriculum guide to integrate the Holiday Units, generally level one in the first year, level two in the second, level three in the third. Utilizing Hebrew Through Movement to complement the learning of blessings and prayers, especially in grades three and above. It’s the latter point that is key to the use of Hebrew Through Movement in part-time Jewish educational settings, for a program that never moves its students beyond the Foundational Units loses the power of HTM for incredible and exciting Hebrew Jewish learning. Students who “play” with key words in prayers, blessings, rituals and songs, and then sing, recite or read the related Hebrew, have incredible ah-ha! moments as they realize they now understand a previously unintelligible language. Many of those using Hebrew Through Movement have hired specialists to rotate into classrooms on a regular basis. This allows for consistent scheduling, coherent teaching across the school, and the ability for the specialists to hone their craft. When a rotating specialist is used, most directors encourage classroom teachers to participate with the students in Hebrew Through Movement. The classroom teachers who learn basic Hebrew vocabulary and commands along with their students, are thus able to expand Hebrew learning beyond the 15 minutes formally scheduled, i.e., as students take out materials, line up by the door, or benefit from a quick burst of activity in between lesson segments. Alternatively, other educational programs hire enough teachers with sufficient Hebrew language background to teach Hebrew Through Movement in their own classrooms. While the Hebrew Through Movement website offers a fair amount of information about the teaching of HTM, the Jewish Education Center of Cleveland’s online seminar develops the specifically needed teaching skills to develop student success. And why introduce Hebrew Through Movement? For decades, Jewish educators have struggled to teach Hebrew in our part-time educational settings. Because we didn’t have enough time to teach Hebrew language AND prayer skills, we often focused on the latter, assuming all would be well. Teachers would generally start with print and move to sound – “this shape is a Mem and it has the sound of M – remember what it looks like and what it sounds like, but don’t confuse it with a Tet.” We’d teach that m’odekha means “with all your might” – an out-of-context word isolated from a grammatically complex prayer (V’ahavta). With this approach, many of our students felt duped after 4-5 years of Hebrew – the learning was hard, and often little was retained. Why do our children they struggle so much, retain so little, and (not surprisingly) bolt from our programs as quickly as possible after Bar or Bat Mitzvah? 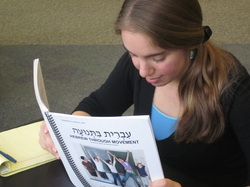 But by introducing Hebrew Through Movement, and spending a number of years providing an enriched approach to language, teachers have a chance of shifting children’s connection to Hebrew AND their ability to actually “read” (i.e., with meaning, albeit with a controlled vocabulary) as compared to “decode” (no understanding). A strong focus on prayer recitation, bringing the sounds of Hebrew prayers into our children’s heads and hearts each time they join together for learning, complements Hebrew Through Movement in creating a sound-to-print progression. And what else would help us move beyond “the impossible?” We can shift our learning of Hebrew decoding, delaying to fifth grade or beyond to allow for more time with Hebrew Through Movement and prayer recitation. The new approach to teaching the Alef-Bet and decoding/reading, Let’s Learn Hebrew Side-by-Side, builds on the Hebrew that children know just by living as Jews (Rosh Hashanah, mazel tov, Bar Mitzvah, etc) and from their Hebrew Through Movement lessons. Change is not easy, but our children are ready for an approach to Hebrew learning that builds on principles of language learning in use for years by French, Spanish, Russian and Chinese language specialists… never mind the learning “structures” that moms and dads of young babies have tapped into for millennia. It’s time, and no, teaching Hebrew language in our part-time settings is not impossible anymore! How's it going across the nation? Check out the Teacher Talk pages of this website - lots of conversation is going on there! Want to gain the skills to teach Hebrew Through Movement? Sign up for the online seminar - registration information is at the bottom of http://www.HebrewThroughMovement.org. I start from the premise, based on research and experience that it takes about five years for a new innovation to become fully entrenched in a school system. What often makes the difference is the support that supervisors provide to teachers new to a methodology. Document the use of HTM through some form for reporting. A new form is now available on the BACKGROUND page of this website, towards the bottom (TPR Weekly Reporting Form) - it will help keep teachers on track and provides a useful resource from year-to-year as new teachers work with a particular class. Make sure teachers have artifacts for the various holiday units. Encourage teachers who are new to HTM to view videos of HTM in action (there are many embedded in the online learning seminar, and others are here on this HebrewThroughMovement.org website). Encourage teachers to think creatively about use of space. Moving outside of the classroom is certainly an option! Below is one suggestion from a Cleveland director: Regarding small classrooms and space issues… I (Marla) have a 4th Grade class who uses TPR every session. Sometimes they go into a hallway or move to another space. When another space isn’t available, the teachers asks all students to stand at their seats and focuses on commands on things they can do from their seats. When the commands require them to move around the room, she invites 1 person from each table to do it at a time. She uses lots of props and the commands focus on things the students can do at their seats with the props. Do not allow special events to pre-empt HTM time. The children should be exposed to HTM every time they meet, even if it is only to reinforce previously introduced material. Most important, continue to use the Teacher Talk section of this website to post your questions and share your successes. I look forward to the ongoing conversation. Comments on this particular blog may be added below! Besides our pilot group, there are have been three formal "start dates" with 20 teachers each into the JECC's online learning Hebrew Through Movement seminar. Another group is due to start at the end of the month. Together with the pilot, almost 100 teachers across the country are currently learning - or practicing - Hebrew Through Movement (TPR) in their classrooms this year. Kol hakavod to all who are part of this effort! Marcia, the facilitator working to support those in the seminar, and I have had some conversations along the way about how teachers are "taking on" Hebrew Through Movement on behalf of their students. There are some who are looking at the model quite purely - it's a format to be understood, practiced, and then student learning assessed so that next-steps can be determined. These teachers are adopting Hebrew Through Movement - the model researched by James J Asher and then adapted by Lifsa Schachter to part time Jewish educational settings. But there are other teachers who seem to be taking a different approach to Hebrew Through Movement - more than just adapting it to the nuances of their own settings, they seem to be taking pieces and parts, seeing this as another way to play Simon Says, though perhaps with a bit more sophistication. From our work in Cleveland, through the expert eyes and support of Dr. Lifsa Schachter, I have seen the benefits of adopting the model, rather than taking a Hebrew teaching concept from here and a method from there. Students come to know what to expect (though also know that the surprises that TPR brings will keep them engaged!). Good TPR learning is intentional, with vocabulary and sentence structure building upon each other so that students come to better understand Hebrew rituals and worship ... Hebrew understanding builds in the kishkes, rather than rote memorization of "5 words in V'ahavta." ** Not to rush. Really. Take on 3 new words at a time and extend their use with your students. Watch the videos offered in the FOUNDATIONAL UNIT section of this website - they'll show you how the first few lessons might unfold ... and in a real classroom, there will be lessons in between these three. ** Not to overwhelm. Fifteen minutes is an optimal time for student learning EACH session. ** To understand that there are nuances to the teaching of Hebrew Through Movement that will take you time to deeply "get." Watch the video of the supervisor and the novice teacher on the BACKGROUND page of this website, as well as the mini-conversation between them at the end of the Level One teaching session (this is in the Foundational Unit section, on the tab that says 1-3). Trust us, this model takes time to learn well. ** To plan ahead for building fun into the lessons. How will you "surprise" students who think they know what you'll ask them to do next? If you've asked two students to run to the table at the front of the room, maybe the third student should be asked to jump backwards, or sit under the table upon arrival. Check out the Spanish video at the top of the HOME page ... students end up in the classroom closet! Yes, a bit surprising! ** Build competence. If you rush through the curriculum guide, students will never really "get" the vocabulary in their kishkes. Repeat previous phrases, be novel in your commands, and take your time. Hmm, did I say that before? Yep, just as I also talked earlier about kishke-learning... something that builds deep in one's gut. It has taken years of TPR sessions for students to get to the level of the 6th graders in the video linked in the "Transformative Power" section of the January 26, 2012 BLOG posting, below. See how the 1st and 2nd graders "get it," and then see where the 6th graders have grown to. ** To have reflective conversations with others. There are many schools with multiple teachers in the online seminar - collaboration is the way-to-go in matters of professional learning, as is support by a supervisor, director or peer teacher. To encourage working together, when three teachers register to the online seminar from one school, the JECC is happy to offer a "no-charge'supervisor's slot" for the fourth person into the course. The JECC's online learning seminar helps teachers competently take on in this powerful method of learning language. Registration information is at the bottom of the homepage of THIS website - http://www.HebrewThroughMovement.org. As I type this there are a few more spaces left in the mid-September "start date," and plenty of openings for the end of September and into October. Please feel free to post comments on this BLOG and/or in the TEACHER TALK section of the website. You can sign in easily with your Google or Facebook account - no "website membership" required. And remember, our curriculum guide was updated this summer - it may be freely downloaded from the HOMEpage of this website. Enjoy the start of the school year!! Hebrew Through Movement is gaining steam! Classes in New Jersey and California have experimented with Hebrew Through Movement this year, joining the teachers in Cleveland who have worked with Hebrew TPR for years. All grew in their understanding of this engaging way to help students learn Hebrew. A dozen teachers from across the country are currently piloting an online learning seminar. Nine modules guide teachers through about 10 hours of online learning that is supported by a very experienced Hebrew TPR teacher; you see her in a number of the videos on this site. Once the seminar is revised, it will be open to teachers at any time of day or night (yes, there will be a tuition charge). What have our teachers (us, too!) learned along the way? That planning is important. TPR teachers can't just walk into their classrooms and "wing it," even if the lesson is "only" 10 minutes long. Learning how to write fun and engaging teaching scripts is key, as is practicing the scripts prior to class so that the lesson flows. Check out http://www.hebrewthroughmovement.org/levels-1---3.html for video examples of a novice teacher (Level 1) and an experienced one (Levels 2 & 3): Note the feedback given to the teacher in the Level 1 video; it's not as easy as it may at first seem! That having the needed supplies is important. Check out the video at the bottom of this page: http://www.hebrewthroughmovement.org/background.html. Also, see how the teacher uses supplies in the Pesach video that you can find via the Holiday Unit drop down menu. That teachers need to have a basic command of the Hebrew language to teach TPR successfully. A well-meaninged teacher who volunteers to teach TPR but has no language background cannot simply memorize scripts and hope that pronunciation and grammar are okay. In addition, we've learned that it's very important for someone with Hebrew expertise to regularly observe new teachers. It's not fair to the students or teacher for pronunciation and grammar errors to be left uncorrected for months. That consistency is important. For Hebrew Through Movement to really make a difference for our students, it has to be taught EACH time a class is in session. That means 10-15 minutes minimum EACH time. For some schools, having a roving specialist helps ensure that Hebrew is taught consistently. For other schools, having teachers integrate TPR in their classrooms works best ... but the directors of these schools have learned that accountability for regular teaching lies with themselves or a department head. It HAS to have priority. ** Moving the online learning seminar from pilot to "real"
Over the summer, perhaps a camp will take on TPR as a great way to teach Hebrew. We'd love to know your questions, thoughts and feedback. Feel free to add a comment here, or post something in the Teacher Talk section of this website. It is with great pleasure that the Jewish Education Center of Cleveland (JECC) announces the creation of a new website that supports the implementation of Hebrew Through Movement (TPR) in part–time Jewish educational settings: http://www.HebrewThroughMovement.org. 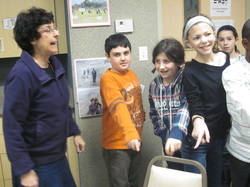 Hebrew Through Movement was developed by Dr. Lifsa Schachter, Professor Emeritus of Siegal College of Judaic Studies. This approach is based on James J Asher’s language teaching model, Total Physical Response (TPR), as well as the work of Bina Guerrieri, a pioneer in applying TPR to the teaching ofHebrew. Over the years, Dr. Schachter has worked with a number of Cleveland educators and schools in the use of Hebrew Through Movement, and has facilitated workshops on it a variety of settings, including the 4-day summer program, Moreh L’Morim. Last year, the JECC’s Curriculum Resources Department partnered with Dr. Schachter to create a formal curriculum and expand the opportunities for teachers to develop their understanding of this model for teaching Hebrew in our part time Jewish settings. Please note the other acknowledgements are at the bottom of the homepage of the site. The JECC’s Hebrew Through Movement website includes a link to an experimental written curriculum (to be revised summer 2012), videos that show this model in action, and other helpful resources and supports (e.g., a place for teacher conversation). Click around the site to see what’s available to you! The JECC is now piloting an online course that carefully builds a teacher’s skills in teaching Hebrew Through Movement. Guided learning, additional videos, teacher supports, and help from an experienced teacher are offered in this learning opportunity. To receive information on this course when it moves out of its pilot phase (summer 2012), send an email to nmoskowitz@jecc.org. While TPR and Hebrew Through Movement seem quite simple in form, attention to the teaching and learning principles brings forth its power. Students physically move at a time of day when such movement is quite welcome! They are engaged and appropriately involved in social experiences with others. More so, TPR and Hebrew Through Movement is fun! That said, it is not “Simon says.” This is carefully considered and controlled language learning, a few new words at a time! There’s a strong feedback loop - teachers constantly reflect on student responses, assess the level of the class, and decide what to do next. The better teachers are not a step ahead of the class – they have a grasp of Hebrew vocabulary, grammar and syntax. They spend time thinking about their teaching scripts and practice them thoroughly before class. As we continue to work with this model of language learning, we wonder about its power to shift the Hebrew curriculum in our part time educational programs. ** If we taught Hebrew this way beginning in Kindergarten, First or even Third Grade, might we be able to wait to teach decoding till the year prior to Bar/Bat Mitzvah? Could children then learn to actually "read" because they are minimally comfortable with Hebrew as a language? Check out this video that shows the progression from 1st to 2nd to 6th grade “Hebrew Through Movement” classes – note the integration of the Hebrew commands with reading practice for the older students: http://www.youtube.com/watch?v=sFXUYntqlDA. In this case, these particular students learned to decode Hebrew using a "normative" primer. ** With time that we gain, might we also be able to shift from “teaching about” prayers to actual praying in our education program? ** What could we do with the learning time that opens up? If Hebrew Through Movement is successful in 15-20 (or even 30) minutes per session, might we have time for learning that challenges and empowers our learners in ways we haven’t been able to with 40 or 50 minute periods? ** How might Hebrew Through Movement enrich the camp setting? Day school learning? Enjoy this website and all that it offers! Feel free to post questions or curricular comments on the Teacher Talk page. Comments may also be added to the blog entry. This blog will be updated by those supporting Hebrew Through Movement in a variety of ways. It might even be you!